In its annual appraisal of 2011 slide presentations Slideshare has uncovered some revealing findings. The appraisal by Rashmi Sinha, looked at all the Slideshare presentations submitted during the course of the year. That’s quite some job. But someone has to do it. Slideshare presentations became longer during the course of the year. But they also used less text. That’s good news for presenters and their audiences. 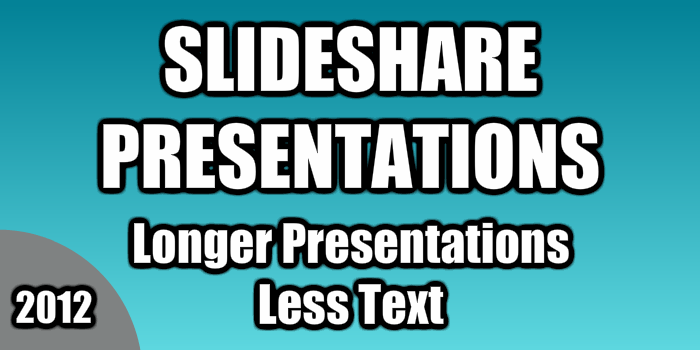 On average Slideshare presentations were 22 slides in length. The longest slide presentation contained 2811 slides. There’s no record of whether anyone has viewed all 2811 slides. Japanese slide presentations take the lead for presentation length with 29 slides on average. And Spanish slide presentations are the shortest with 20 slides on average. Should we wonder? Who knows. Slideshare presentations submitted by men (26 slides) appear to be longer than those submitted by women (22 slides). Eminently believable! And, of course, social media, web technology and computing dominate much of the subject material on the Slideshare site. There are many presentations formats on the site. But Microsoft PowerPoint presentation formats are still dominant. But, look that Keynote presentations made up 1.7% of the presentations on the site, but 8.2% of the popular presentations. Does this say something about the Keynote presentation software or the creativity of Keynote users? You decide. “Business” was the most popular tag during the year, with “marketing” and “twitter” following closely. Image concentration in the Slideshare presentations was also notable. Across all presentations the average number of images was 21, with 72% of slides containing images. That’s always good news. Because PowerPoint overload really is something that audiences don’t like. That’s why your presentation design choices are so important. In the subset of popular presentations, the average number of images per presentation grew to 37, with 62% of slides containing images. An intriguing finding: there’s a stronger correlation between the popularity of a slide deck and the number of images in the slide deck, but a weaker correlation between popularity and the % of slides containing images. It suggests that more images in your presentations could be the right course…for popularity. But don’t ignore the role played by non-visual slides. Intriguing. There’s a more recent example of a slideshare career advice presentation. Lots of words, but good images. So, we can guess these findings point the way to better presentations and more satisfied audiences. Great. Perhaps an end to death by PowerPoint. Don’t forget that you can always improve the quality of your presentation design choices with PresentPerfectTM training. You can choose a one day course, one-to-one coaching or, perhaps a corporate training day. Whatever your presentation needs, please don’t hesitate to get in touch. Keynote presentations made up 1.7% of the presentations on the site, but 8.2% of the popular presentations. Does this say something about the Keynote presentation software or the creativity of Keynote users? You decide.